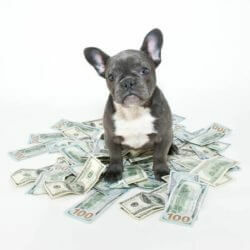 Good Dog Training Isn't Expensive, It's Priceless! Why Working With an Expert Can Save You Money. Good Dog Training Isn’t Expensive, It’s Priceless! Why Working With an Expert Can Save You Money. A professional dog trainer understands animal learning theory and how it applies to your dog and his/her issues. A professional dog trainer has worked with lots of dogs of all shapes, sizes, and breeds. They will have a general knowledge of typical breed specific behavior and/or health issues and how those could be affecting your dog’s behavior. A Professional dog trainer has practiced their observation skills for years and can spot things that you may have missed or thought irrelevant. A professional dog trainer will know how to change behavior while making the situation as safe as possible. There are ways to manage dogs that are aggressive and fearful that will prevent anyone from getting hurt while changing the dog’s behavior. A professional dog trainer will participate in continuing education. They stay up to date on the latest behavioral studies and techniques and know which methods to use for a given situation. A professional dog trainer will know about what techniques will help you and your dog efficiently, without making the behavior worse. Their career is working with dogs. They have the skills, training, and experience. A Professional dog trainer will have a basic understanding of normal behavior versus neurotic behavior which may require medication. A Professional dog trainer will know when to refer you to a veterinarian for a health exam or blood tests. A professional dog trainer will put you on track with your new puppy or give you the knowledge and tools to work with your adult dog’s behaviors. A professional dog trainer will be familiar with a dog’s developmental stages (both physical and mental) so that you can make the right decisions about proper socialization and health procedures. A professional dog trainer has the mechanical skills needed for leash handling, timing of rewards, and when to raise or lower criteria. Best of all, you won’t waste time reading the wrong things on the internet or following well-meant, but wrong, advice. You won’t have to decipher between modern, up-to-date information and outdated information. You won’t have to go through “trial and error” training which will waste time and may compromise your relationship with your dog.